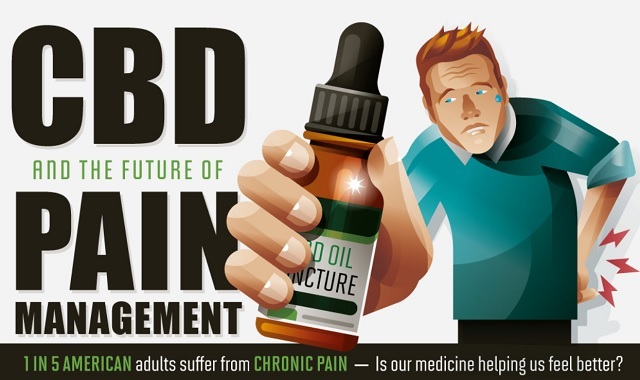 CBD and Pain Management #infographic ~ Visualistan '+g+"
In an announcement from the FDA, shocking details on the side effects of non-aspirin NSAIDs were revealed. Citing a connection between heart attacks, stroke, and other complications to stem from NSAID usage, millions of Americans were left to choose: live with chronic pain, or risk the side effects? Ten years following the initial warning, the FDA doubled down to include further risks with prolonged use and more complications at higher doses, and the future prospects of NSAIDs don’t look good. Despite these warnings, many folks were left to fill their prescriptions without another option - until now. Cannabidiol, better known by its acronym CBD, is an all-natural compound extracted from hemp or marijuana plants. Though its controversial origins may give it a bad rap or even outright rejection, understanding exactly how it impacts our bodies and our healing could mean a brand new and totally effective means of chronic pain treatment. Take a look at this infographic for more on the effects of CBD, what conditions it helps treat and manage, and how to know if it’s the right option for you.